Make Your Glass Top Stove Clean As Can Be! Glass top stoves are a smooth and modern addition to any kitchen. They’re elegant and can even double as extra counter space in a pinch. The problem? It is tough to keep this elegant glass top stove clean – even the slightest drip from the pan will look highly conspicuous without immediate cleaning. You can plan on spraying a cleansing solution and wiping down the stove after every use, but chances are there will be times where you decide to chow down on your food before cleaning. 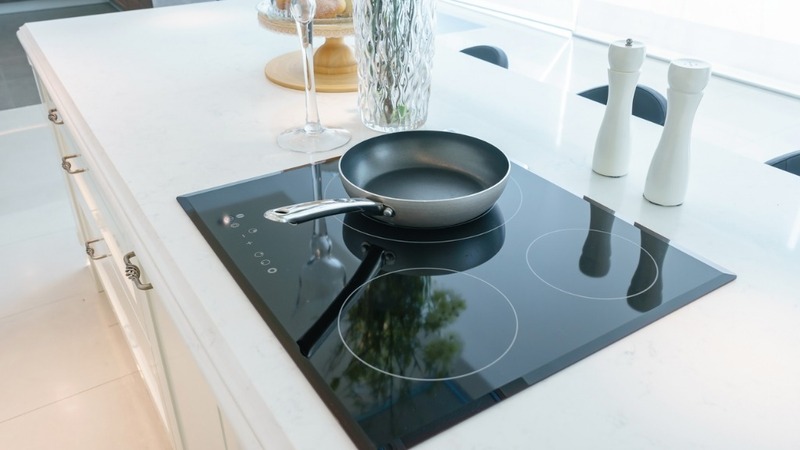 After the fact, it will take a bit of effort to learn how to clean your glass stove top, but you will be able to get your glass top stove back to a brand new shine. Learn this highly effective method for cleaning your glass top stove that is both simple and cost-effective! We promised a cost-effective and easy way to learn how to clean glass stove tops, so stay away from buying cleansing products at your grocery store. Instead, gather some common household items – that’s all you’ll need to effectively clean your glass top stove. 1) Collect the cleaning materials. Find you baking soda and white vinegar, as these two products will be your primary glass stove top cleaners. Also acquire a few cloths or towels, a spray bottle, and either a scrub brush or a graspable razor. 2) Wipe with vinegar. After making sure that the stove top is cool, spray the glass top with white vinegar and wipe it down with a cloth. This will successfully remove any large surface scraps as well as degrease the surface. Of course, you can use any cleansing product here, but vinegar is usually the most available. 3) Sprinkle baking soda. After the vinegar has been removed from the stove, cover the entire stove top liberally with baking soda. This will breakdown the grime that has built up on your stove top and will make scrubbing possible without scratching your glass. 4) Cover with a damp towel. Find a towel large enough to cover your stove top and dampen it with hot water. If you can’t locate a large enough towel, you can piece together smaller ones. Leave the towel on top of the baking soda and stove for 15 minutes to let everything soak. 5) Scrub. After the 15 minutes are up, use the same towel to scrub with the baking soda and clean the stove. Frequently rinse and wring your towel and keep scrubbing until all the baking soda has left the surface. 6) Scrape with a razor or scrub brush. Use your razor or scrub brush to remove any stubborn debris that is still stuck on the glass top stove. It is important to do this while the stove is still damp and work with an even motion, so you don’t scratch the glass. 7) Finish with vinegar again. When your stove is looking much cleaner, polish it one more time by spraying vinegar and scrubbing with a damp cloth. Clean it all down with a dry cloth to really make it shine. Now that you know how to clean glass stove tops, it doesn’t seem too hard anymore. Using this easy method, you won’t have to worry about stains and burnt scraps from ruining the modern and elegant look of your glass top stove. Be sure to clean your glass top stove regularly so you can cook to your heart’s content. Now you’ve learnt how to clean glass top stoves so thanks for reading!